Everyone loves a savings, and it’s especially nice to see it happen monthly, like on your energy bill. 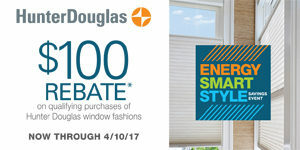 And now it’s even better because Hunter Douglas is offering rebates on several of its energy-efficient window treatments—they help insulate rooms from external hot or cold air, which reduces energy costs. To get the full details on the promotion, talk to a trained consultant at Windows, Walls & More in Bloomfield Hills today. This rebates-based event runs from January 14 to April 10, 2017. To participate, buy the specified number of select products, mail in the promotion form and a copy of your receipt, and wait for your rebate to arrive in the form of prepaid rewards cards. The Energy Smart Style Savings Event does have limitations and restrictions that apply, so please see us for details. Vignette® Modern Roman Shades. The Vignette is a new twist on a time-tested classic! With beautiful teardrop-shaped folds and no exposed rear cords, Vignette keeps your windows uncluttered. Solera® Soft Shades combine a soft sculptured look with a cellular construction that insulates your window. If you’re considering new energy-efficient window treatments, you owe it to yourself to take the time to consider Solera® Soft Shades. Duette® Vertiglide™ Honeycomb Shade is ideal for large windows. Made with the honeycomb-shaped Duette fabric, the Vertiglide offers benefits like improved energy efficiency, security, and a beautiful sleek design. Duette® Honeycomb Shades are made with two or more layers of pleated fabric that form a honeycomb-shaped cell that traps air and provides an extra layer of insulation at the window. They’re attractive and functional at the same time.